Guerra de Idolos is an American 120 minute scripted romance television series, which kicked off on April 24, 2017, on Telemundo and is broadcast every Monday at 21:00. The show is currently in its 1st season. 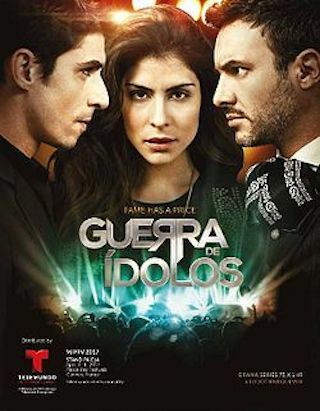 Guerra de Idolos (War of Idols) is an American telenovela created Mariano Calasso for Telemundo. This series is taped in Mexico and It is the first musical telenovela on Telemundo that will play the genre of Northern Music. This series follows the story of the Solar family, and superstar Julio Cesar Solar, a regional Mexican music idol. A story of betrayal, rivalry, love and the search for fame at any cost. Set in a world of stunning ranches, parties, private jets and recording studios, "War of Idols" showcases the lives of those who manage and control the Latin music business in the US from coast to coast.